Departure from Yamunotri helipad (07: 45 AM). Arrival at Harsil Helipad (08:30 AM). Start the day early. Depart from Harsil helipad by 9.00 AM. Due to government regulation, you have to change chopper at Guptkashi helipad to continue to Kedarnath. Deboard and aboard the new helicopter awaiting for your further journey. Arrive at Kedarnath helipad by 10.00 AM approx. Surrounded by snowcapped peaks, Kedarnath is the most remote site among all Char Dhams in Uttarakhand. 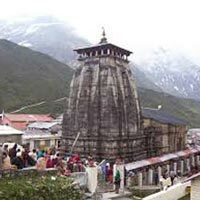 The Kedarnath temple, the holy shrine of Lord Shiva houses one of the 12 Jyotirlingas in India. The temple lies at a distance of approximately 500m from the helipad and reaching it would take about 15 minutes. 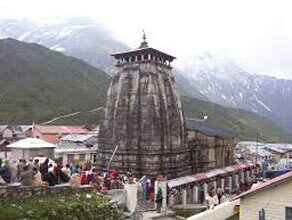 The Kedarnath temple was originally constructed by the Pandava brothers of the Hindu epic, Mahabharata and later renovated by Adi Shankaracharya during the 8th century. At the temple entrance gate, there is a Nandi bull statue (the divine bull of the Lord). Pay respects to bull and the divine lingam of Lord Shiva. Next, proceed to the ancient Triyuginarayan temple, which is dedicated to Lord Vishnu, is built on the site where it's believed that Lord Vishnu had witnessed the wedding ceremony of Lord Shiva and Goddess Parvati. You will be spending the night at Kedarnath. A Rudra Abhishek has been scheduled at the Kedarnath temple at 4 AM. Today depart from Kedarnath. Your chopper will take you to Guptkashi helipad for change of helicopter. Board the new helicopter at 10:15 AM and you will arrive at Badrinath helipad by 11:00 AM. Deboard at Badrinath helipad, after which you will be transferred to the hotel. Complete your check-in formalities at the hotel, and get ready to visit the Badrinath temple. The holy temple of Lord Vishnu, known as Lord Badri here is one of the divine 108 divya desams. Take blessings of the Lord. Later, move on for a visit to the Mana village, close to Badrinath temple, the last village before Indo-China border, inhabited by an Indo-Mongolian tribe. The highlight of Badrinath yatra is the special Maha Abhishek Pooja, which commences at 4 AM sharp in early morning and continues for almost 2hrs. Special arrangement has been made for you to sit inside the temple and watch the proceedings of the Shringar rituals of the deity. Departure from Badrinath helipad (11:30 AM).